Shaniya Murray is the first girl in City College High School history to make the baseball team. And she's reminding everyone why she deserves the jersey. BALTIMORE, Md. 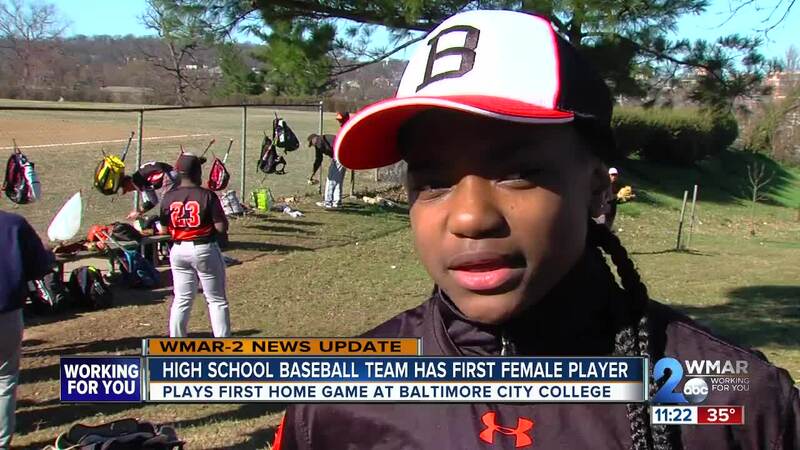 — Shaniya Murray is the first girl in City College High School history to make the baseball team. And she's reminding everyone why she deserves the jersey. In early March, Baltimore City College baseball coaches had a huge dilemma. They had so many students try out for a spot on the school's baseball team, but only had 25 jersey's to fill. During their tryouts, Freshman Shaniya Murray took her love for the sport, crushed all of her nervousness, and built up the courage to try out for the team. We're happy to announce, not only did she make the secure her spot, but she is the very first girl to join the baseball team in the school's history. "When I found out I made the team I was shocked like I didn't think I was going to make it at first but it felt good to make it, everybody was proud of me and it showed me that I can do anything I put my mind to it," said Shaniya. She plays second base and got her first on Monday with a double and knocking in two. She says said she was a little nervous for her home game on Tuesday against Digital Harbor so she didn't pitch, she walked. Shaniya says she doesn't want to make a big deal on history making, she just wants her team to win.